Dottie Kluttz reads two poems by Kat McIlhagga ... "Lent is not for the Faint Hearted" and "Promise of Spring"
Before giving the Prayers for the People, Rev. 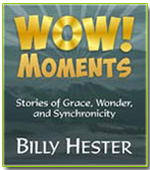 Grady Mills tells what brought him and his wife Brenda to Asbury Memorial in 2007. Pre Sermon Announcements from Rev. Billy Hester including information about services for Joel Parks and Jackie Hines, both coming up this Saturday at the church, about the congregational meeting on April 2 in the sanctuary concerning the future state of Asbury then two wedding anniversaries ... Jane & Jerry Timmie, their 53rd and Roger & Diane Amerson, their 55th. 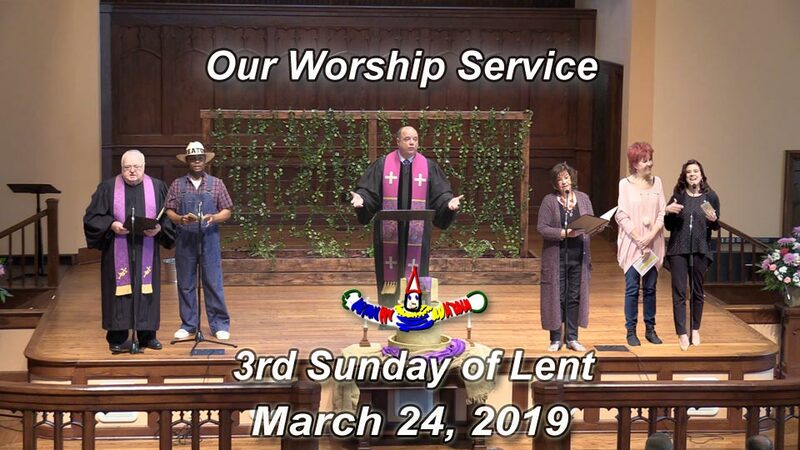 The sermon is based upon the scripture from Luke 13:1-9 ... 'Repent or Perish' and about the fig tree that didn't bear fruit given a second chance. Repent in such a way as to bring heaven on earth. 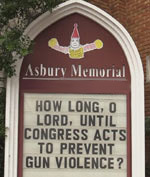 With the current gun violence, how can one repent in such a way, what about common sense gun laws? The fact that we are alive we have been given that 2nd chance; Wha would you do with it today? Rev. Billy Hester gives the Benediction then Cheri Hesters 'signs' to the congregation as they sing "Here I Am Lord"